Researchers at the Department of Chemistry of the University of Warsaw in Poland have developed a new graphene matrix, as a functional substrate for immobilizing enzymes, and the method of its preparation. The newly-patented graphene matrix may find applications in the food and medicine industries, like the production of biosensors and other electronic devices (eg. bands, tattoos). The invention is used as a stable system with high sensitivity, not only in analytical biosensors, but also in bio-fuel cells used in medicine, biology and chemical biocatalysis. The solution concerns the enzymatic (protein) sensor construction for detection of lactates, which can be used in the food industry and medicine for the production of biosensors. XFNano's graphene materials were recently used in two fascinating research work focused on advanced energy applications. The first is a work by teams from Anhui Normal University, Chinese Academy of Sciences (CAS) and the University of the Chinese Academy of Sciences which developed a fast, one-step strategy to prepare sandwiched metal hydroxide/graphene composites through a kinetically controlled coprecipitation under room temperature. Such NiCo-HS@G nano-composite exhibits good electrocatalytic activity for OER, superior to most of the reported OER catalysts. 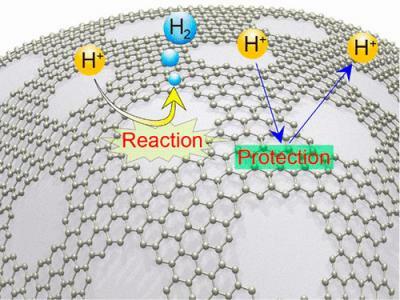 Such performance and the facile preparation of NiCo-HS@G opens up a new avenue for the cost-effective and low-energy-consumption production of various sandwiched metal hydroxides/graphene composites as efficient OER electrocatalysts with desired morphology and competing performance for the applications in diverse energy devices. Researchers at the U.S. Department of Energy’s (DOE) Brookhaven National Laboratory are part of a scientific collaboration that has identified a new electrocatalyst that efficiently converts CO2 to carbon monoxide (CO), a highly energetic molecule. “There are many ways to use CO,” says Eli Stavitski, a scientist at Brookhaven and an author on the paper. “You can react it with water to produce energy-rich hydrogen gas, or with hydrogen to produce useful chemicals, such as hydrocarbons or alcohols. If there were a sustainable, cost-efficient route to transform CO2 to CO, it would benefit society greatly”. Indeed, scientists have been looking for a way to do just that, but traditional electrocatalysts can't effectively initiate the reaction. That’s because a competing reaction, called the hydrogen evolution reaction (HER) or “water splitting,” takes precedence over the CO2 conversion reaction.